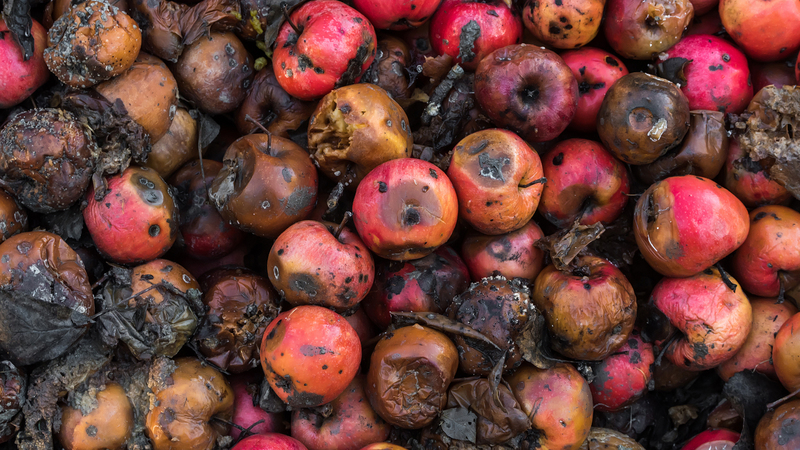 Food waste has troubling implications that go well beyond world hunger—from the squandering of increasingly scarce land resources to the generation of greenhouse gases. A change in approach is long overdue. Over-ordering food. Over-catering for an event. Getting larger portions than anticipated or requested. We’ve grown used to it, especially in the West, just as we’ve grown used to discarding the leftovers. After all, it’s just a relatively small unnecessary expense, right? Ours is a disposable society, where abundance leads to apathy. This applies to many commodities, but it’s especially noteworthy when it comes to food: leftovers are often treated as refuse, whether by households, restaurants, supermarkets or other food outlets. Let’s look for a moment at a very different principle at work in a very different time. In the biblical account of one of Jesus’ miracles, we read that He blessed five loaves of barley bread and two fish. Not only did it satisfy a crowd of at least 5,000 hungry people, but there were leftovers: “When they had all had enough to eat, he said to his disciples, ‘Gather the pieces that are left over. Let nothing be wasted’” (John 6:12, New International Version; emphasis added). They collected 12 baskets full. We’re not told what happened to the leftovers, but the implication is clear: it was not just to be discarded. Today that approach is more than just commendable; it’s critical. Why? The answer lies in part in considering the true cost of the food we waste. The Food and Agriculture Organization of the United Nations (FAO) produced the “Food Wastage Footprint” report in 2013. According to the executive summary, “FAO estimates that each year, approximately one-third of all food produced for human consumption in the world is lost or wasted.” It calculates the direct cost to be about US$750 billion, equivalent to the gross domestic product of Switzerland. But wasted food comes at an environmental cost too: in effect, the land, water and energy used to grow that food is also discarded. However, the FAO estimates that the global carbon footprint of wasted food in 2011 was the equivalent of 4.4 gigatonnes of CO2 (4.4 trillion kilograms, or 7.3 trillion pounds). 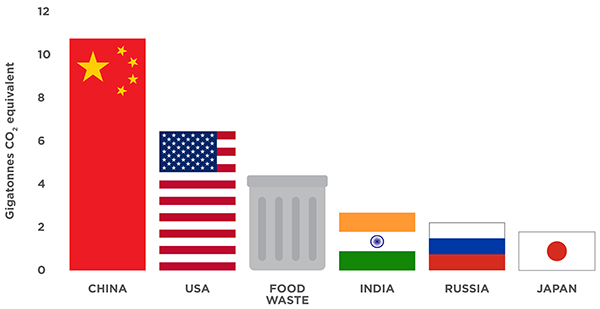 To put that figure in perspective, they add that if food waste were a country, it would rank third as a greenhouse gas (GHG) emitter after the United States and China. Likewise, the report indicates that the water used to produce food that is ultimately wasted is more than the water used to produce the food consumed by any single nation in the world. This comes at a time when concerns over the impact of global warming from GHG emissions, as well as the potential for civil unrest and war resulting from water scarcity, are growing. The situation is no less alarming when we consider land use. The FAO reports that the production of food that will be wasted requires about 28 percent of the world’s agricultural land area. Again, if food waste were a country, the land it occupied in production would place it second, by surface area, behind the Russian Federation. Concurrently we put pressure on land through urbanization, raising crops as biofuels and animal foodstuffs, and feeding the world’s growing middle class with more meat and dairy products. Further complicating the picture, nations concerned about supplying their populations with affordable food have engaged in the large-scale purchase of land to bolster food security. A 2011 Oxfam report, “Land and Power: The Growing Scandal Surrounding the New Wave of Investments in Land,” indicates that “as many as 227 million hectares of land—an area the size of Western Europe—has been sold or leased since 2001, mostly to international investors.” These investors often convert the land to monoculture, with little regard for the rights and livelihoods of landowners or the larger social, economic and environmental impact of what in many cases amounts to a land grab. Clearly the pressure is on, and with the problems we face, we overlook abuse and massive food waste in the global food chain at our peril. If food wastage were a country, it would rank third in greenhouse-gas emissions. Too Many Mouths to Feed? Of course, we also need to consider that the world’s population is growing. In their book Food Foolish, John Mandyck and Eric Schultz argue for a sustainable food system: “It’s not enough just to feed today’s 7 billion people. We need to leave enough good land, clean air, freshwater and biodiversity to sustainably feed the more than 9 billion expected by 2050.” Ironically, they add, we currently produce enough food globally to feed everybody on the planet today and those expected by 2050. In the United Kingdom the Waste and Resources Action Programme (WRAP) has set an ambitious target of cutting food waste by 50 percent by 2025. WRAP launched its Love Food Hate Waste campaign in 2007; they note that the UK is “saving £3.3 billion a year compared with 2007, not to mention saving 4.4 million tonnes of CO2.” Globally, WRAP has partnered with the FAO and the United Nations Environment Programme (UNEP) to develop a food-waste guidance document to assist public and private sectors in strategic development. Much of the educational effort involves raising awareness and providing people with simple solutions to make a difference. For example, planning meals, writing a shopping list, buying no more than the quantities needed, being willing to buy less-than-perfect fruit and vegetables, being resourceful about making a meal out of leftovers, and asking for a “doggy bag” at restaurants are all proven ways to reduce food waste. Food removed from supermarket shelves before the use-by date, whether because it has passed its sell-by date or for cosmetic reasons, can still be used. In many cities, food banks collect food that is still perfectly edible and distribute it to low-income households struggling to adequately and healthily feed themselves. Since 2005 Walmart has donated 3.3 billion pounds of food for this purpose. The British retailer Sainsbury’s, apart from donating surplus food, also sends waste food to generate electricity via an anaerobic digestion process that produces gas as well as fertilizer. They also have a superstore that runs on electricity generated solely from food waste. While much can be done on the consumption side of the equation, the same applies to the production and distribution side. Human ingenuity being what it is, someone somewhere will seek solutions to known problems, often in novel ways. Elise Golan, also contributing to Food Waste Across the Supply Chain, highlights some of the possible technologies currently in development, which researchers hope will contribute to a more food-secure world. They include using coffee grounds and potato waste as substitutes for peat moss; creating new ingredients for food and animal feed from fish-processing waste; using olive-mill wastewater in body-care products or drinks; and taking the grape seeds left over from wine production to make a flour that can help lower the risks of heart disease and obesity. Much of the loss is due to poor distribution and storage systems. In many places the infrastructure to facilitate getting goods from field to market is lacking. Poor roads and communication, insufficient refrigeration during transportation, and storage facilities that fail to prevent losses due to pests and pathogens all contribute to food wastage. Economic factors play a part too: low prices or surplus production may make harvesting certain crops uneconomical, and they are instead left to rot in fields. Some grassroots efforts are already making a difference. In a modern twist on Jesus’ miracle of feeding 5,000 people and not wasting the bountiful leftovers, a London-based organization known as Feedback has instituted the Gleaning Network, whereby volunteers work with farmers to salvage food that would otherwise be wasted and make it available to those in need. Their flagship event is called Feeding the 5000. At each event, held in cities around the world from London to New York and Amsterdam to Sydney, they feed 5,000 people a meal prepared entirely from salvaged food. We can each make a difference. But will it be enough? The good news is that whatever progress we make or fail to make globally today, we can look to a promising future. The One who was concerned that leftover fragments of loaves and fish be gleaned assures a time of abundance and plenty ahead: “Do not fear, my land! Rejoice and be glad, because the Lord has accomplished great things! Do not fear, wild animals! For the pastures of the wilderness are again green with grass. Indeed, the trees bear their fruit; the fig tree and the vine yield to their fullest. Citizens of Zion, rejoice! Be glad because of what the Lord your God has done! For he has given to you the early rains as vindication. He has sent to you the rains—both the early and the late rains as formerly. The threshing floors are full of grain; the vats overflow with fresh wine and olive oil” (Joel 2:21–24, New English Translation). Efforts at alleviating food waste are critical, and each one of us can have an effect in our own small sphere of influence. But human nature being what it is, ultimately it will take a top-down godly intervention to solve the problem globally, once and for all. Reeducation will play a major role. That will doubtless include not wasting the earth’s resources, but there’s so much more that needs fixing; food waste is just one aspect that will be tackled, as all of humanity learns how to live in harmony with the planet and each other. Jonathan Bloom and Steven M. Finn, “Wasted Food: From Conundrum to Clarity” in Food Waste Across the Supply Chain: A US Perspective on a Global Problem, edited by Zhengxia Dou et al. (2016). Food and Agriculture Organization of the United Nations, “Food Wastage Footprint and Climate Change” (2015). Food and Agriculture Organization of the United Nations, “Food Wastage Footprint: Impacts on Natural Resources—Summary Report” (2013). Elise Golan, “Targeting Federal Programs and Policies to Combat Food Loss and Waste” in Food Waste Across the Supply Chain: A US Perspective on a Global Problem, edited by Zhengxia Dou et al. (2016). John M. Mandyck and Eric B. Schultz, Food Foolish: The Hidden Connection Between Food Waste, Hunger and Climate Change (2015). Oxfam International, “Land and Power: The Growing Scandal Surrounding the New Wave of Investments in Land” (2011). Global Problems, Global Solutions, Part 2: What Shall We Eat and Drink?